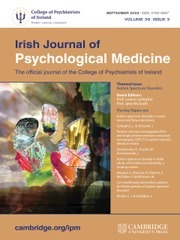 Established in 1982, the Irish Journal of Psychological Medicine is dedicated to acting as an international forum for the publication of research on the science and practice of psychiatry. Its main aim is to disseminate original scientific research to a national and international readership with the objective of improving clinical practice and service development in mental health. The journal advocates for delivering high quality clinical care and improvement in mental health services, and is committed to keeping the field of mental health vibrant and relevant by publishing research on novel topics. Particular strengths and unique features of the Journal include a focus on Clinical Psychiatry, Youth Mental Health and History of Psychiatry, with regular features and special issues devoted to these topics. With a progressive focus, the journal provides important reading for clinicians, researchers, policymakers and all professionals with an interest in mental health.